You cannot see many radios nowadays and that is fair enough because we don’t need them. That is what we all think when we listen to the term radio, right? Well, radios are still being used in huge numbers especially in the worksite where conditions are particularly tough. You cannot just carry around your normal MP3 or CD/DVD player around in these conditions and there are many reasons for it. The most important reason is that most regular MP3 players are not durable enough and won’t survive in tough conditions such as that of a construction site. The dust, moisture, job debris, and impacts will definitely destroy any audio player out there in the market. The worst part? You won’t even get any replacements for these broken pieces because these accidental damages aren’t covered in the warranty of the product. So, here comes the real use of radios. But the radios we are talking about here are not like the classic radios you might have in your mind. These are called “jobsite” or “worksite” radios and they are named like that for a reason. Keep reading and you will find out why. 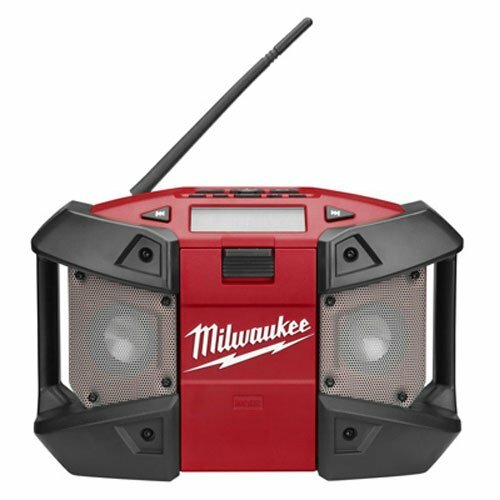 In this article we will discuss all that is to know about the Milwaukee M12 Cordless Job-Site Radio 2590-20 including the description, features, pros&cons, frequently asked questions and some customer reviews too. This detailed guide will definitely help you know all about this awesome radio and if you still are left with any queries we are happy to help. The basic description of this radio is where we will begin our guide with, like every other guide to be honest. A product description is always a must. So here we go with our short and sweet product description. Strong but lightweight as it weighs around 5.15 pounds only. It does not require much power so it runs perfectly on a single 12Volt battery. The Lithium-Ion batteries last for as long as 12 hours. This Milwaukee product comes with a warranty of 5 years. It also has an AUX port and AC adaptor. It comes in shiny red color which is made to last forever. It is housed in a shock absorbing material and design. The product is strongly built and very durable. This radio has a separate MP3 compartment which is weather sealed and protects the device. The speakers on this product are made from premium aluminum which also happens to be waterproof. This radio can be powered via a 12 Volt battery or an Ac adaptor. It is lightweight and weighs around 5 lbs. It is very light in weight If you are wearing gloves, buttons are difficult to use. Long battery life which lasts up to 12 hours You cannot go to the next or previous station, you have to scroll again. Can I fit any larger phones or my tab in the sealed section of this radio? Will they still be safe? Answer: You can definitely fit most of the phone in the sealed compartment. though you will not be able to place your tab in that because it can host any device with 3″x5″ dimensions only. It it bluetooth enabled radio also? If not how can I play my favourite music on this? Answer: No, this radio does not have the Bluetooth connectivity option but you can connect your mobile phone via the aux port and play your favorite music while working. Is it loud enough for small get togethers or parties? Answer: Yes, it is loud enough and pretty decent option for this price and well it stays on for 12 hours in case your parties get extended. I had a different music system before my husband started working in a construction firm. But it did not survive for long. I got to know about worksite radios for one of my friends and I bought this one. This little beast out here is the only indestructible thing I happen to know. It has taken so many blows in the construction site but apart from minor scratches on the outer surface nothing is ever wrong with it. You can go ahead with this radio and you won’t regret it. I just received my order today and as expected by Milwaukee, it is a great piece and I tested all kinds of music and it has the perfect loudness, bass and sound quality. This does not seem to be very strong on the pictures but trust me guys this radio is made as a tank. If a big AC adapter doesn’t bother you much this radio is perfect for you. It has everything that should be present in a worksite radio. Strongly built, lightweight, great sound quality, amazing battery life, and 5 years warranty too. There’s probably nothing more than you can expect from a company at this price. We hope this buyer’s guide was worth reading for you and if you have any queries feel free to ask in the comment box below.